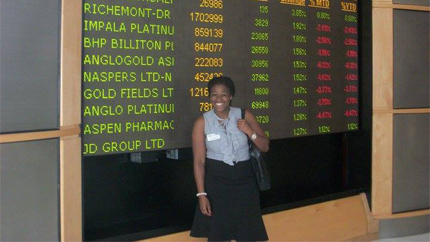 Faith Gaines, Gallup employee, studied abroad in Cape Town, South Africa. Ever wonder how studying abroad can help you reach your career goals? Studies show that studying abroad can help give you an edge on the job market through the competitive skills you gain while on your experience. Students who study abroad become aware of a world beyond their borders. They experience firsthand other countries’ political, cultural, economic, and social environments and practices and how those impact global events. They may even master a new language. The ability to immerse yourself in a culture different from your own not only shows prospective employers your international awareness, but also your adaptability and creativity. Faith Gaines, now a consultant at Gallup, says that studying abroad helped her "learn to think more creatively when solving problems, how to adapt within diverse environments, and how to communicate across cultures." Taking the leap to study abroad will also make your resume stand out to any employer because it shows independence, a tolerance for risk-taking and the ability to take initiative, all valued skills in the workforce. Cheryl Steele, Senior Vice President and Managing Director of Business Development at FleishmanHillard, knows firsthand the benefits of studying abroad. "The experience of an international education demonstrates not only intellectual curiosity, but also a spirit of adventure and authentic engagement that are hallmarks of successful [employees]," she said. Lastly, studying abroad opens doors. Eric Boyle, Vice President of International Development for ICF International, says, “No exaggeration: I would not be the person I am if it weren’t for educational exchange programs. From the time I met someone from Venezuela who was studying abroad at my small high school in Kentucky to hiring former exchange program participants in my current job, educational exchange has given me invaluable insights of the complexities of an interconnected world."